And for this halloween, Clementine takes the mask off! 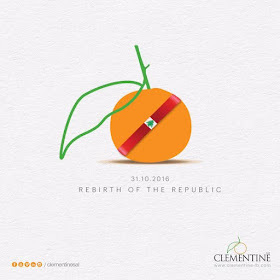 Well yes, Clementine the baby sister of the "Orange" (or the trademark color of the Free Patriotic Movement that Michel Aoun who is about to be elected president today) goes back to its roots safely, and creatively indeed, as they celebrate a day they have waited for so long. "Good things come to those who wait" said the Guinness Beer slogan, applies to juicy agencies in Lebanon as well!